Fall Out Boy in Montreal or Quebec City? Inform me about the next events for Fall Out Boy. 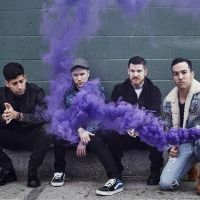 Enroll yourself to our priority waiting list for Fall Out Boy to be alerted when new tickets are available. Filling this form doesn't engage you to any purchase. Fall Out Boy is joining the joint Blink 182/Weezer summer tour. This tour, which promises to be a tremendous rock event, will be stopping by Montreal on August 8th, at the Bell Center, after rocking out the Pepsi Coliseum in Quebec City the day before. Fans of Fall Out Boy are very fortunate to have this second chance in barely 3 months to see their favorite band live. Fall Out Boy played at the Metropolis in May as part of their Believers Never Die Part Deux tour. Fall Out Boy performed songs from their latest album Folie à deux released last December. This is the 6th studio album for the young pop-punk band and includes the single I Don’t Care.